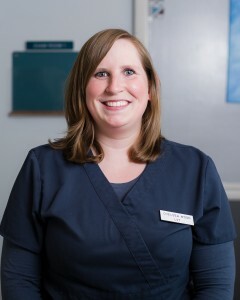 Chelsea has worked at the clinic for 3 years, initially starting as a Veterinary Assistant. She wanted to be a veterinarian initially when she job shadowed at a clinic in high school, starting as a Kennel Assistant in 2002 where she got to see a lot of alternative medicine practiced. She has worked in the field in different clinics for 11 years and was inspired to continue in her chosen path after getting to see a dachsund that wasn’t able to use his back end, after going through a number of different treatments and then after years of acupuncture was able to pedal his back legs. Outside of the clinic, she hikes with her two Boxers, Thor and Mia, enjoys reading at home, going to the beach with her husband and playing with her cat Newton.